A quick answer would be yes for the crawlspace venting and not-venting. However, there are many supplemental conditions that would support each “yes” answer, and there are ways to make any condition favorable to either – the only thing in your way is usually just the cost. Summer in Illinois is often hot and very humid. The theory was that in such weather, crawlspace vents would allow the humidity trapped under the house to be exhausted to the exterior… Well, it took a few decades to realize that the theory was wrong. What actually happens during the humid summer is that passive (non mechanical) crawlspace vents will actually contribute to increasing the humidity under the floor and in our house unless the floor has a moisture barrier underneath. If you have any fuel burning appliances installed in the crawlspace area, you’ll need so called make-up air / combustion air, which is necessary for a proper burning process. Unless the appliances have a sealed combustion / burner chamber and use exterior air for combustion (most high efficiency furnaces, but not all of them), you might need a vent installed in the crawlspace area providing combustion air from the exterior. If you’re not sure, have a licensed HVAC contractor to check it for you. Where warranted by climatic conditions, crawlspace ventilation openings to the outdoors are not required if ventilation openings to the interior are provided. 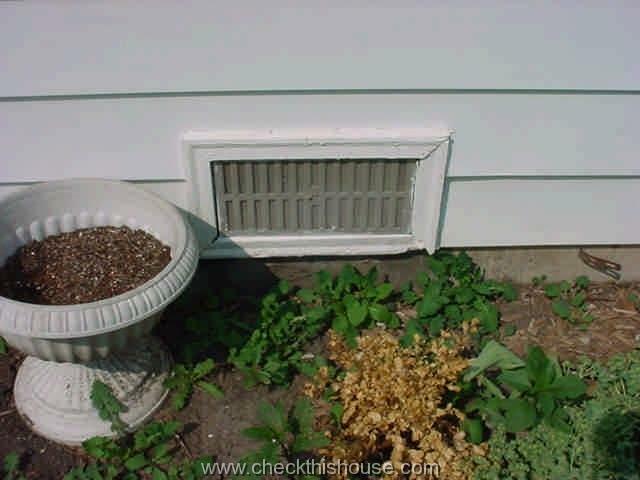 This crawlspace ventilation exception would apply to houses with partial basements and crawlspaces connected together. Split level homes often have such designs and do not require crawlspace vents. For a house with a full crawlspace underneath , you’d have to have an opening in the house floor that permits air exchange between the crawlspace and a living area. The exchange will happen automatically, and it is called the stack effect (the warm air is lighter than the cold one and it raises, first in the crawlspace, then through the floor, ceiling, attic, and roof vents). Assuming that your crawlspace is 100% dry, insulated, and has no Radon or any other problems – you can close the crawlspace vents (check HVAC combustion air requirements). Just don’t put a crawlspace vent register in your house floor without checking your crawlspace condition first. The total area of crawlspace ventilation openings is permitted to be reduced to 1/1,500 of the under-floor area where the ground surface is treated with an approved vapor retarder material and the required openings are placed so as to provide cross ventilation of the space. The installation of operable louvers shall not be prohibited. 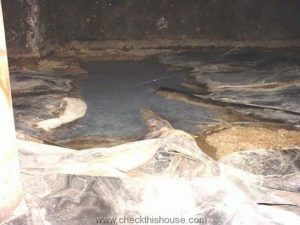 This exception suggests that you seal the crawlspace floor with an approved vapor retarder (which is very good), and lowers the number of required passive vent openings in the crawlspace foundation or right above it (which is also good, because we get closer to eliminating them completely). Passive crawlspace vents installed in the foundation wall don’t work in humid conditions as originally anticipated, and this has been already scientifically proved … so I’m wondering why they are still required, if instead of removing humidity, they will transfer more into the crawlspace during the humid summer months. Flooded crawlspaces – no matter how good your crawlspace ventilation would be, standing water will not evaporate through any vents. You have to correct the problem that is causing flooding, and properly installed drainage system with an efficient sump pump usually does the job. 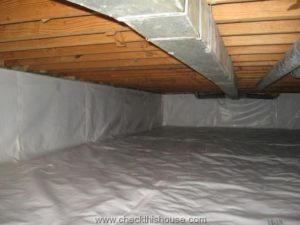 Install Vapor Barrier on the entire crawlspace floor and part of the foundation – various types of liners are currently available with some advanced ones composed out of multi-ply materials with exceptional strength and also treated with antimicrobial agents that prevent mold and mildew growth under their surface.I wouldn’t recommend going all the way up to the framing with that liner if there’s a possibility of the crawlspace termite infestation (Termites might build their mud tubes under the sheeting and infest the framing without you even knowing about it). When the Vapor Barrier installation procedure is done professionally, the moisture should no longer be an issue in your crawlspace. Don’t insulate your house floor for the following option (I personally prefer this one)! Install a mechanical crawlspace vent in your foundation wall, place a damper between the living space and the crawl space, and a monitoring system (control module in your house, and temperature / humidity sensor in the crawlspace, with and optional exterior temperature / humidity sensor).This system operates by analyzing the temperature and humidity changes in the crawlspace (and optionally from exterior), and activating the mechanical vent and damper whenever needed. The damper opens only for the period of time the crawlspace fan operates. This option fully complies with the code and eliminates all passive crawlspace vents. The alternative is using the mechanical crawlspace vent and one passive vent on the opposite side of the crawlspace, keeping the living area completely isolated. The advantage of the first setup keeps the crawlspace conditioned with your house air and you don’t have to worry about freezing water pipes during the winter. With the second option, I would suggest insulating the house floor, air ducts, and water pipes. 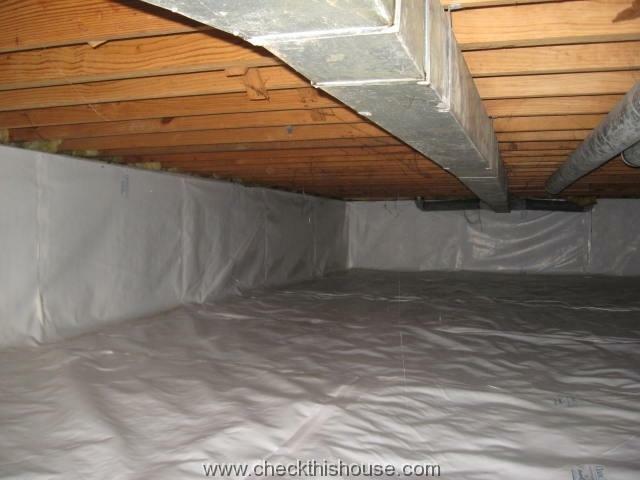 If your house has a crawlspace – make sure that you visit it periodically! For help on what to look for under the floor, you may also wish to check “Crawlspace Inspection” section on my website. Happy Crawling!